Ginger refers to the underground bulb belonging to the plant. It has been used for centuries as a condiment in many Asian cultures, imparting a tangy and pungent taste to food. 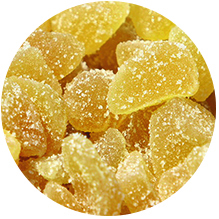 Studies have shown that dried ginger possesses many therapeutic properties. It has a potent antioxidant as well as an anti-inflammatory effect. Ginger is loaded with nutrients and bioactive compounds that have powerful benefits for the body. It is used in traditional medicine to relieve gastrointestinal distress. It has high mineral content, being a good source of potassium, magnesium, copper, manganese and vitamin B6. Sliced ginger is widely used in the bakery and also in the chocolate industries.